i was doing some sort of daily good stuff thingy this week wasn't i? let's just add that to the very long list of things i have said i will do/photograph/write here and then have never mentioned again. my internet is painfully slow this week and i am tired, tired, tired from working late into the evening on ye olde sewing machine and then dealing she-who-likes-to-wake-frequently so that i never seem to get more than 3 hours of sleep at a time. of course there are still a billion things in my life could list in my good stuff series but i found i'm too lazy to take pictures this week and i like to have a good image to go with words. 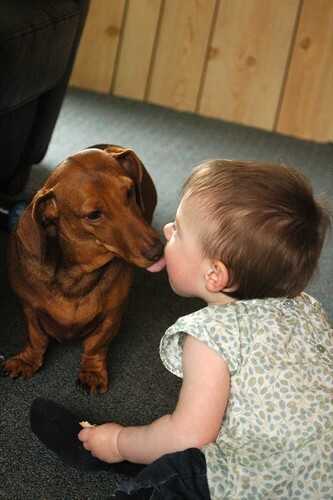 So is the dog tasting the baby or the baby tasting the dog? Definitely good stuff - what an adorable pair. Such a sweet photo! One for the 21st birthday party! Hi Leslie, sorry it has taken me so long to get back to you. I had to laugh when you described your daughter's antics when in bed with you, my daughter does all the same things, stabbing her finger up my nose, playing with everything on the bedside table! How are you guys doing now sleep-wise? I am going to attempt the crib one more time next week. I was going to do it this week, but we have both been sick with the flu. I noticed from your recent photo that Mae isn't walking yet, she has her walker, my daughter Pilar is the same, not walking yet, but loves the $8 walker my mom got for her at a second hand store. I really enjoy your blog, and your quilts! I love that photo, your doggie is so much like our Cedar. Well what she was like 5 years ago before she went gray, not sure if it is old age or the fact that she now has my 4 kids to stress over. i want a doxie so bad!! there's one at my job who's stolen my heart :) such an adorable pic!